Why in the name of all that's good and holy are we debating Bundee Aki's place in the Irish squad the week before our first international of the season? Just over a year ago on these very pages I offered my own opinion, for what its worth, on the 'project player' system. To summarise, I thought three years was fine and if anything changed it could be the amount of such players test teams could carry in their squad for any given match day. Clearly this was a minority opinion as World Rugby went ahead and upped the residency rule to five years. That's fine. You don't get everything you want, but if you love the game you accept it and soldier on. At least that's how I see it...others seem to have difficulty accepting rules they don't agree with. Whatever changes the governing body were to make, those who had already committed to a three-year plan found themselves unaffected. That really should go without saying. So to lie in the long grass and wait until just before one such player's debut to bring it all up again is...well, what is it? Before I explore that, let's be clear on who we're dealing with. It's not just Neil Francis in the Irish media who feels like this. I watched Luke Fitzgerald speak after a Leinster match last season about the same subject - his tone may have been a lot more diplomatic than Franno's, but the thrust of his argument was about the same, and what's more, he cited Bundee Aki as an example, which was odd as Leinster's opponents that day had been Connacht and a smattering of their fans were there listening to him speak. I found it interesting that on the latest edition of the Indo's 'Left-Wing' podcast, for which Luke's face features on the logo, he wasn't available to offer his take. OK, so maybe he was abroad at the time of recording - but could there not have been a phone link? Anyway - batting for him was Tony Ward, who professed he agreed about the system although he went out of his way to point out that 'this isn't about Aki'. Those are just a few examples of commentators who feel this way, and I'm sure there are more, but my main focus is the timing of this ridiculous narrative which IMO is by no means coincidental. 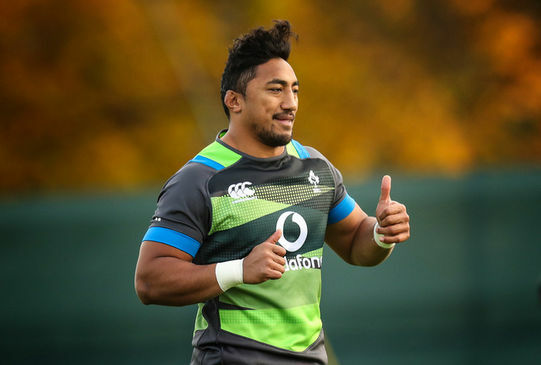 Everyone who knows anything about Irish rugby will tell you that given the current state of affairs in our test squad health-wise, it was pretty obvious that Bundee Aki was going to start this weekend. We can debate for hours where the motivation comes from. Maybe it's a genuine opinion. Maybe it's sensationalism to sell newspapers. Maybe they're jostling for position to replace George Hook as Irish rugby's Curmudgeon In Chief. I suppose you'd have to ask them. But if we claim to be a nation that offers a hundred thousand welcomes to people who come to see the Book of Kells and kiss the Blarney Stone, then surely we can muster at least one to a rugby player who agreed to the rules as they were at the time, moved half way round the world and had great success in over three years at Connacht? Thankfully I'm confident the vast majority of true Irish fans will cheer for Ireland on Saturday, safe in the knowledge that all 23 have earned the right to wear the jersey. Click here for the thread on our Facebook page associated with this article.